On TNT last Thursday, Charles Barkley brought out his usual mock neck best to the panel. You'd think he'd dress up for the occasion, considering the extra hour-long show to début the NBA All-Star Reserves. Kenny, Ernie and the always stylish Chris Webber all wore proper, well-fitting suits. The fabric prints and layering are debatable for some, but at least they weren't wearing a Hanes t-shirt under an oversized, ill-fitting grey jacket. 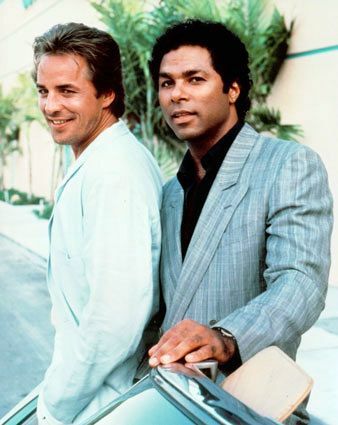 The whole thing just felt a little Miami Vice to me....minus the polyester (god I hope, because when a big man sweats in unnatural fibre...). TUURRRRRIBLE! I could chastise Barkley for his awful choice of attire more....but frankly, he's been doing it for some time. Ever since the Round Mound of Rebound let his waist get bigger than his head, he's been opting out of the collared shirt and fitted suit get up most of the time. Yes, we all gain weight and Barkley should never be Rajon Rondo thin, but the clothes can give you shape! Sir Charles, you are TNT royalty, why wouldn't you want to fit the part? It takes a little more work or even, just a very diligent well paid stylist and tailor to give you the shape you want. Suits are made to give you shape, not try and make you look bigger with an oversized jacket. A good fabric won't add shine to reflect light and make you look bigger or cling to you in less than desirable spots. The mock top completely cuts off any length to your neck as well, so you get the snowman effect. You become round mounds on top of bigger mounds, and not a human proper shape. 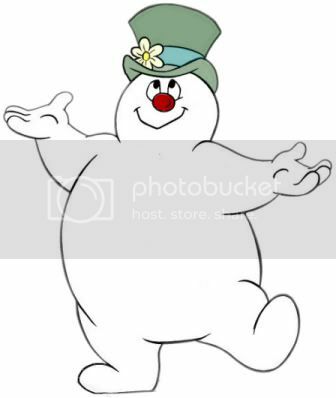 And who wants to resemble Frosty the snowman instead of a real live man? (And no, I'm not talking about Frosty ala Clipse). 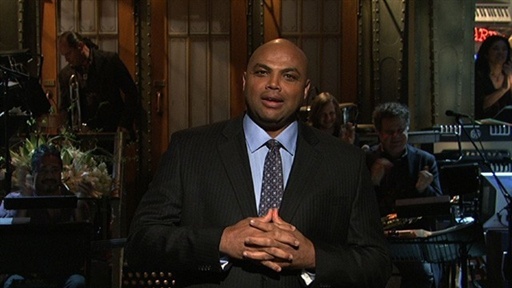 I was shocked when Barkley was hosting SNL for the second time this past January and he wore *gasp* a real suit AND (slightly dated) tie! It's a wonder what working with a good stylist will do for you. He looked taller, leaner and younger than he has in years. Though, being in commercials next to modern NBA gods like Dwyane Wade and Dwight Howard wouldn't really enhance your self-image. The game that TNT was featuring last Thursday was the Boston Celtics visiting the Orlando Magic. Despite Craig Sager's best blatant attempt at shock value in a suit, it was Van Gundy's attire that disturbed me more....HE WAS MATCHING CHARLES BARKLEY! Perhaps all this time SVG has not been impersonating Ron Jeremy and his famous pornstache, but Sir Charles instead. The only difference was that Stan Van was wearing a black mock neck polo (but done up tight to the neck) and the same ill-fitting grey jacket. Stan, like Charles, used to wear suit and ties and slightly more appropriate outfits. But he has become the sideline model for mock neck shirts and bulky jackets, and sometimes worse, turtle necks! Turtle necks are a husky man's worse nightmare as it not only cuts of the neck and any length but also gives zero shape, structure of definition. More often than not, the wearer looks like a blob rather than a respected NBA head coach. Sir Charles and Mr. Van Gundy, I beg of you, review your wardrobes! You're in HD now so NOTHING is hidden. Embrace your shape and learn to make it work for you, not against you and a widescreen. And as a quick side note, Kurt Warner wore his own version of the black polo and grey jacket during his retirement press conference. But for some reason, it seemed to work. Maybe it's because he's a retiree in Arizona and that outfit seems to scream casual golf course. But mostly, it was because it FITS. Gentlemen, please know your size, not just in your pants but around them as well.